Mujaddara is a perfect dish for vegans to eat because the lentils and the rice combined together create a complete protein containing all the essential amino acids our body needs to build new cells. So not only is this dish delicious and comforting, it's incredibly nutritious as well. This simple peasant dish has been around for thousands of years and is mostly eaten in the Middle East. I remember when I worked for a high-tech company 12 years ago, there was this small Middle Eastern cafe that served the best Mujaddara I've ever tasted. I would eat it practically every day for lunch and was bummed when they closed on weekends because they only catered to the corporate crowd. So I started making it at home and have been eating it ever since. I usually serve this with Tahini Mint Sauce, but you can serve it plain or with a Pomegranate Vinaigrette drizzled on top. This dish is delicious, nutritious and inexpensive and can be either enjoyed hot or cold anytime of the year! Cook lentils in a large pot of simmering water just until tender for about 15-20 minutes. Do not over cook. Drain and set aside. Cook rice according to package. With any brown rice, I use a 2:1 ratio of water to rice. I like my rice to have structure and crunch. While rice and lentils are cooking add 1 tbsp of olive oil to a large frying pan and caramelize the onions until golden brown. Add garlic and saute for a minute but be careful not to burn. Add vegetable stock, cinnamon, cumin, and cook until almost all stock is evaporated. 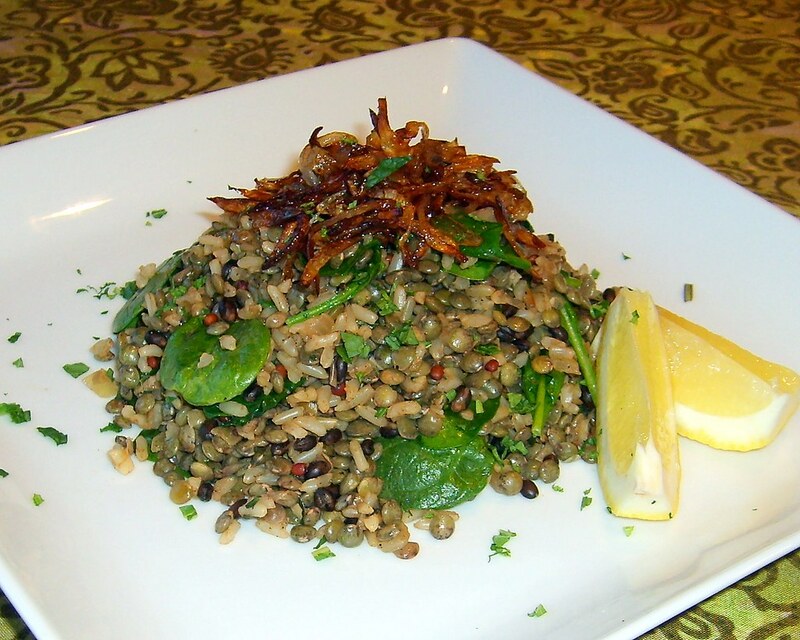 Add drained lentils, brown rice, spinach, chopped mint, lemon juice and salt and pepper to taste. Stir to combine and cook on low until spinach is slightly wilted and pilaf is hot. Set aside. In another small saute pan on medium heat, add the remaining 1 tbsp olive oil and caramelize shallots until golden brown. Garnish pilaf with caramelized shallots, mint and pass the Tahini sauce on the side for drizzling.